Greetings! 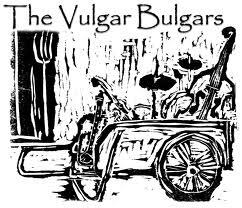 We are the Vulgar Bulgars, Central Virginia’s hottest Klezmer band! Our music is fun, energetic, and highly dance-able. We invite you to take a spin around the site, look at some photos, listen to some music samples, and if you like what you hear, get in touch with us! You can write us at vulgarbulgars -at- gmail -dot- com or call Kassia at 434.806.9241. See us live or buy our CD. Challah Good! ← The Vulgar Bulgars are Back!! !